Item # 309922 Stash Points: 3,095 (?) This is the number of points you get in The Zumiez Stash for purchasing this item. Stash points are redeemable for exclusive rewards only available to Zumiez Stash members. To redeem your points check out the rewards catalog on thestash.zumiez.com. Top off your daily fashion in army fatigue-inspired style with the Obey Mad River Camo Bucket Hat. Unstructured throughout for a soft feel, this hat features an allover khaki camo print and an embroidered script logo at the front crown for classic branding and flair. 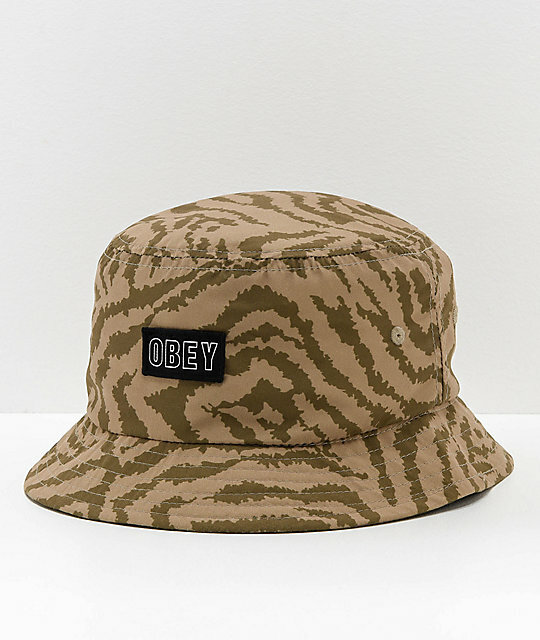 International Khaki Bucket Hat from Obey. Embroidered logo patch on the front crown.